I needed a break from Assassin's Creed anyway. No offence to the sub-genre, but I feel like I burned out on 2D platformers with either a novel art style or emotional angle shortly after indie games exploded on PC a few years ago. Gris, though, is arriving at a point when I'm absolutely in the mood for a game like this, sandwiched between time-eaters like Assassin's Creed Odyssey and Fallout 76. It's relatively familiar light puzzle fare, but it has an outstanding hard pencil/watercolour art style, and its world feels enormous thanks to the clever ways it plays with scale. In Gris, you're playing as a young woman who's dealing with some unnamed sorrow. You're left to figure out the particulars of the story based on the imagery in the world (more on that later), but in-game your time is mostly spent using her dress to solve puzzles in different ways. You unlock more functions for the dress as you get deeper into the game. Turning it into a cube shape, for example, transforms Gris into a heavy object that can break through fragile parts of the environment, or make items fall from trees. You can also use the dress to float as a kind of double jump, and later swim quickly through underwater environments. It's a very handy piece of clothing, all said. 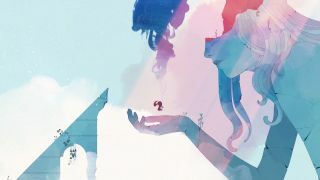 Gris is a gently paced trek through a lovely-looking world, with predictably nice music and frequently gorgeous animation, even if it feels like an amalgamation of about four or five games I've played before. That's not a bad thing for me, though—I expected a certain variance in atmosphere from this game, alternating between desolate, cutesy and hopeful, and so far I'm getting it. Later in the preview build, I encounter a bird that screams at Gris, knocking her off the environment unless I turn her into a cube to resist its force. The bird really does look like a drawing come to life—a shutter-y animation effect enhances the visual impact of the creatures you encounter in the game, and the larger animals are spectacular. The camera will sometimes pull out to illustrate how tiny Gris looks next to the rest of the environment, which gives the impression that its 2D world is bigger than it is. None of the puzzles are hard enough that I got stuck in the early part of this game, but they're taxing enough that Gris is more than just walking sideways while nice music and environments happen around you. In an icy area of the world, every few seconds the cold will intensify, and an ice structure will be formed in the image of Gris at that exact moment, before shattering a few seconds later. There's a clever puzzle involving this part of the level that I won't spoil, but it makes you think about how to use her different abilities in a smart way. This is the level of complexity I'm comfortable with given the game's overall dreamy tone. There are also optional puzzles in the game that are a little trickier, a couple of which I'm pretty sure I accidentally solved before learning they weren't mandatory. The developers hint that there's some wider meaning to the symbolism in the game's world. Honestly, I could list some English Literature course-style nonsense here interpreting all the broken statues of sad women, or why there's a giant angry bird squawking at me, or why there's a nice little cube man who'll do things for me when I feed him an apple. Really, though, I'd be meeting the game more than halfway on what it's willing to tell me. If there's some greater meaning to Gris beyond some abstract exploration of sorrow or grief, I've personally not found it easy to pick up on. That's okay with me, though—poking through the colourful world of Gris is rewarding enough for me. It shows me pretty environments and beautifully animated creatures frequently enough that I want to see the rest of its world. I thought this was the sort of game I no longer had an urge to play, but Gris doesn't have a million quest markers, so it's found me at exactly the right time. Gris will be released on December 13.